I have always been a fan of black and white, and cards are no exception. Lately I've been seeing a lot of gingham papers being introduced by some companies in their spring lineup. While looking through my stash I came across this black and white gingham and this card was born! It's the usual size ( 4-1/4 x 5-1/2 inches and is top opening). 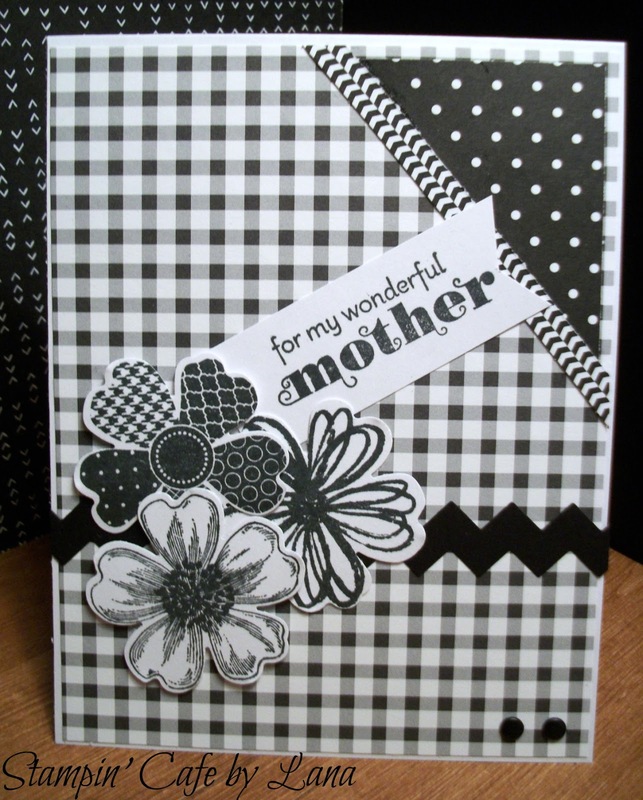 I added a piece of black and white polka dot paper to the righthand corner and a strip of black and white paper between the two designs. The flowers are from the Flower Shop stamp set by Stampin' Up and punched out with the coordinating punch. The "rick-rack" is cut using a Sissix border die set by Stephanie Barnard. The stamp is from Delightful Dozen, a retired stamp set by Stampin' Up. I added two little black enamel dots to the bottom corner and the card was finished! Thanks for stopping by! See you again next week! Sure! I think it would make a fun card for a workshop!